This delicious scent will fill your house with the aroma of freshly-baked gingerbread. A rich spice blend of cinnamon and ginger, supported by vanilla and a touch of cookie dough, create a warm winter blend. 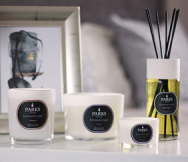 The sweetness and spice are balanced with smoky cedarwood and creamy sandalwood..